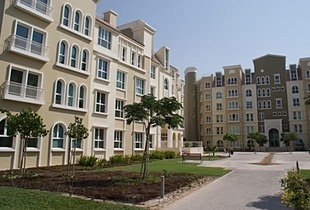 'My neighbourhood' articles will provide information from people living in Dubai's various residential areas. This is Discovery Gardens' chance to shine! This is a huge area of ……… low level housing blocks where the traffic tries to burst out in the morning causing a few headaches for the less patient among us! Dubai’s Roads and Transport Authority (RTA) quickly helped to reduce the traffic tailbacks by building a roundabout (earlier in 2014) after the intersection at the Enoc Petrol Station at the Ibn Battuta Gate . This roundabout takes the traffic onto Sheikh Zayed Road (North towards Deira). Traffic going south towards Jebel Ali and Abu Dhabi is taken over the Sheikh Zayed Road and funnelled onto the Sheikh Zayed Road by way of two roundabouts to the south side of the highway. Most buildings have a security service. The buildings appear to be managed by different companies and owned by different landlords and according to local gossip there is a big difference in the various blocks’ quality of management and services because of this. There is ample parking in the area – fabulous! There are other areas being developed closeby, e.g. Al Furjan. The Ibn Battuta Mall is close to Discovery Gardens and has restaurants, a cinema and a variety of shops including opticians (eye tests for driving only), Western dress shops, e.g. Next, H&M etc. link provides a complete list of shops as well as the location and contact numbers. The Ibn Battuta Gate Hotel, a Movenpick Hotel, is opposite the Ibn Battuta Mall. There are offices on one side of the gate, residential units and the hotel on the other side. The hotel has a beautifully decorated grand hall and a number of restaurants. What’s it like to live in Discovery Gardens? We would love to hear your stories. Have you moved into Discovery Gardens recently? What do you think of your building, your neighbours, your landlord? Have you had any problems and have you enjoyed living there. What about moving in/moving out – did you face any issues? Did you have any problems connecting DEWA? Have you seen any green parrots? Or any bugs? The more people know about the areas and of the buildings, the better. Remember when you first arrived? How did you decide on an area? Was there any information available to you which you could trust? Is there a community website? Or a networking group in Discovery Gardens? What about local shopping, hairdressers and what is your opinion of those you’ve used in Discovery Gardens. If you didn’t use them, why not? Did you use a good/bad real estate agent? Tell us more! We aim to gather as much information as possible – your help and advice are invaluable. We’re hoping Rant n Rave give you the chance to air your views and to tell us about your experience of living in Discovery Gardens. We look forward to hearing about your building and your experience of living in Discovery Gardens. All names and private details remain confidential and will not be shared with a third party or published at any time.